Losing a loved one can be one of the most difficult situations we can face in life. The death of a partner, parent, child or anyone close to us can be all-consuming, and feel overwhelmingly impossible to process. Grief is something that everyone will experience at some point and the majority of people will not necessarily ‘get over’ the death of a person close to them, but will slowly learn to live without that person in their life. Death is not necessarily a part of life that can be accepted by many, but with time the physical and emotional pain that comes with grief, will lessen. DENIAL AND ISOLATION – The initial reaction to the death of a loved one is denial and isolation and is usually the first of the 5 stages of grief. This is a normal response and is the body’s defence mechanism that helps us to cope with the initial shock and trauma. A person is likely to deny the reality of losing the person and will find it difficult to process the situation. Denial and isolation is, for some, a way of not wanting to face what has happened, as others try and help to be there for them. Detaching themselves from others who may be grieving may feel easier, so that they are only having to face and deal with their own emotions. ANGER – As denial subsides, anger can take over. Losing the person that they love becomes more real and frustration and rage can be overwhelmingly irrational. They may feel anger at the people trying to comfort them, angry at strangers and even angry at the person who has died. Although they know that they are not to blame, irrational emotions can make them feel resentful and emotionally confused from the intense sadness they are feeling. BARGAINING – As time goes by, a person will start to feel like they need to take back some control of their life and try to steady the emotional rollercoaster that they have been on. Feelings of vulnerability will exaggerate feelings of powerlessness in relation to how the person died and they may be repeating several bargaining statements as they try to make sense of what has happened. ‘If only we had got to the hospital sooner’ and ‘Perhaps the doctor did not do the best they could have’…. Reasoning or bargaining are ways of trying to find answers and trying to process what has happened. DEPRESSION – While not everyone experiences depression after the death of a loved one, they may struggle with emotional difficulties and need extra support. There can be two types of depression from grief, the first being a feeling of guilt that they may have been so self-absorbed from their mourning that they have partly abandoned people who rely on them (I.E. children). They may feel guilty or depressed that they are worrying about how they are going to pay for funeral costs, or how they are going to survive without that person’s income. These emotions can be irrational and confusing. The second type of depression is simply the reality of how they are going to live their life without their loved one. These strong and often agonising thoughts may make a person retreat when actually talking to a friend would be the best way to help themselves. ACCEPTANCE – Whether a loved one has been lost through a long-suffering terminal illness or it was a sudden unexpected death, grieving will always be a major process to go through for the people they have left behind. The final phase of the 5 stages of grief is acceptance. There eventually comes a time of peace and calm, when emotions have quietened and are less erratic and when the person feels more in control of their feelings. Reaching out for help is often the last thing a person wants to do if they are mourning the loss of a loved one. They may feel that they do not want to be a burden on family or friends and that they just have to learn to get on with their lives without that person around. Grief and bereavement counsellors are expertly trained to help a person to work through and process the 5 stages of grief, giving them support and reassurance that what they are going through is normal. Bereavement experts encourage a person to communicate their emotions and feelings with others, to keep talking and to ask for emotional support when they need it. 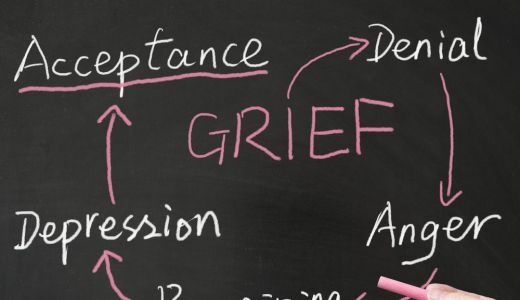 Burying grief is not helpful in the long-run and however painful it may be to deal with, letting it flow and being open about it, may speed up the 5 stages of grief. Losing a loved one is a sad and difficult time but knowing that they are around us in spirit can be reassuring, heart-warming and enlightening. Mediums have the ability to connect with your loved ones who have passed over and give you messages of love from the other side. Speak to the UK’s most gifted and experienced Mediums at TheCircle. They will connect with your loved ones and give you compassionate reassurance for your future, helping you to focus on the positive aspects of your life.